Europe is one of the seven continents of the world, made up of approximately 50 countries. It is the second smallest continent in the world by surface area (6.8% of the world's land area). It has a total population of 733 million (11% of the world's population) that speaks many different regional languages, in most cases one language per country. Its population density is one of the highest in the world, despite its small land area. The United Kingdom and Ireland are countries located on islands in the northwest of Europe. Politically and economically, they belong to Europe (like Iceland too), but some inhabitants of the British Isles tend to consider themselves outside Europe in a certain sense when they use the term Europe to refer to all of the continent except the British Isles. Europe is the cradle of "Western" civilization. Important European cultures in antiquity were Ancient Greece and the Roman Empire. When the latter fell apart, it left Europe in many small and largely independent states. Simultaneously, the Christian religion spread like a wave over all of Europe, extinguishing all former (pagan) religions and faith groups. By the Middle Ages, all peoples of Europe, irrespective of their country and language, had one common religion. European history has been very violent with probably more wars and battles than in any other continent in the world. Throughout European history, there have been periods of prosperity and periods of great misery, caused by wars and plagues. The Renaissance and the New Monarchs marked the start of a period of discovery, exploration, and increase in scientific knowledge. In the first half of the 20th century, Europe was shattered by World War I and World War II. The second half of the 20th century saw the formation of the European Union, a union of currently twenty-seven independent states, founded to enhance political, economic and social co-operation and integration. 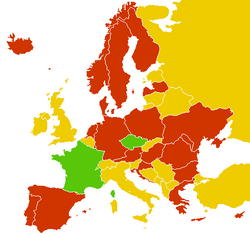 Legality of child corporal punishment in Europe (2007). Green: domestic and school corporal punishment permitted. Yellow: domestic corporal punishment permitted, school corporal punishment forbidden. Red: domestic and school corporal punishment forbidden. Although spanking is also found in many non-western civilisations, its widespread use in Europe since antiquity was what also introduced this method of corporal punishment to many other places that were colonized by the Europeans and/or run over with European settlers, such as almost all of North, Central and South America, parts of Africa, South Asia, Southeast Asia, and Australia. Spanking has been the number one parenting method in practically all of Europe for more than 2000 years. For dozens of generations, there was little or no European child who was not beaten, whipped and spanked occasionally or regularly throughout his or her childhood, by his/her parents, teachers or other adults who felt it their right and duty to correct them. One can only speculate on the impact of the strict and sometimes cruel European child-raising methods on European culture and history. Strangely enough, the popularity of spanking in Europe took a sudden U-turn in the 20th century, resulting in corporal punishment being abandoned and outlawed in schools, and in some countries, a few years or decades later also in the home. Today, spanking one's children is illegal in many European countries and has become very rare in the others. The "spanking debate" which is still very vividly discussed in other places such as North America or Australia, has practically come to an end in Europe in the 1970s and 1980s when a no-compromize anti-spanking position became the standard point of view to be held. Large parts of the European society began to feel that any form of corporal punishment was an inacceptable violation of the person's human rights. Spanking children was increasingly considered as unacceptable for a modern society as wive-beating. Those who felt differently did in most cases no longer dare to express their pro-spanking views openly. This has not changed to the present day. Simultaneously, consensual adult spanking and spanking fetishism has become more and more common in Europe since the 1970s, and especially since the 1990s when the Internet pushed the trend. Some people theorize whether the Western spankophilia trend can be seen as a product of its spanking-rich history, or of its recent abandonment of child spanking. The currently biggest spanking scene in Europe is probably found in the U.K.
Europe is the richest source of early spanking art and spanking literature, with literary descriptions of spanking and spanking imagery since the Roman times, the Middle Ages, and Renaissance. Also European writers and artists created an overwhelming number of literary and visual works since the 19th and 20th century, especially from France, the U.K. and Germany. This page was last edited on 17 December 2012, at 13:43.